Teflon pans are a big no-no! | That's Bad For You! Teflon pans are a big no-no! Teflon, non-stick pans are widely preferred when cooking. People use them because for one, they prevent your food from sticking to the bottom of the pan, preventing ruin of your beautiful food creations. Number two, they minimize the amount of oil needed to sauté your veggies and prevent fast burning. Well sorry cooks, chefs and foodies, Teflon can kill you! Well, eventually. 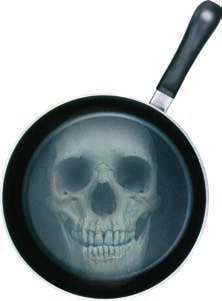 Teflon pans release extremely toxic gasses into the air and into your food. Also little particles from the non-stick coating can get into your food releasing chemicals into your system. The non-stick coating contains PFOA, the same crap used to make those deadly microwave popcorn bags that I posted about a few weeks ago. According to studies, PFOAs cannot be broken down by the environment and can be found in 92% of humans. They can even kill cows if they ingest food or water polluted by it. So here you have it folks! Teflon pans can kill you and they’re definitely bad for you. So you can either take heed, or keep continue cooking away with them. Bon apétit! This entry was posted in Bad For No Reason, Extremely Bad and tagged non-stick pans, PFOAs, safe cooking, Teflon, toxins by thatsbad4u. Bookmark the permalink. I have heard that teflon was dangerous. I always thought it was because the coating can eventually flake off in your food. I never it a toxic gas. Thanks so much for sharing this!